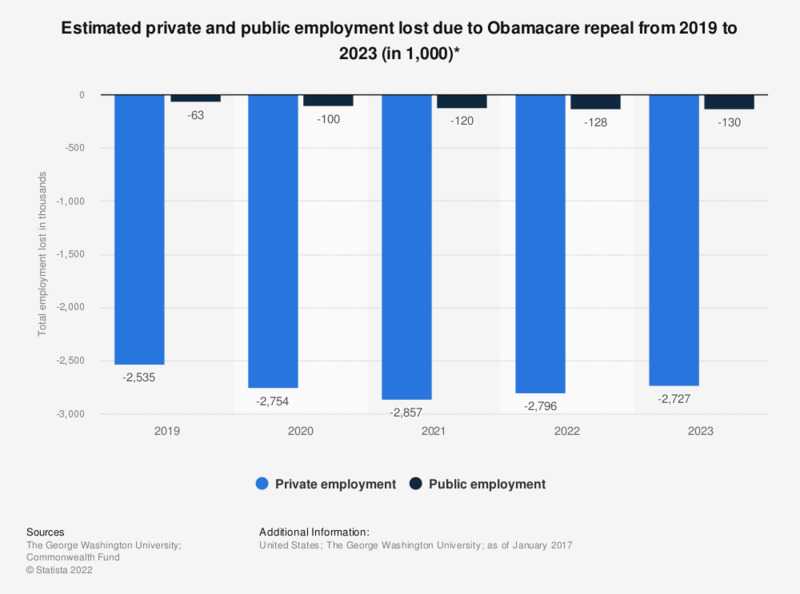 This statistic shows the estimated private and public jobs lost due to a possible repeal of Obamacare which would mean the repeal of premium tax credits and Medicaid expansion, from 2019 to 2023. The number of private jobs lost due to repealing premium tax credits and Medicaid expansion would be some 2.54 million in 2019. * Repeal of premium tax credits and Medicaid expansion. Note: All figures are based on a multistate economic forecasting model (PI+ from Regional Economic Models, Inc.) to quantify for each state the effects of the federal spending cuts. Health expenditures in the U.S.